New town halls, water woes, more staffing cuts within the Whitehall School district, and a historic building reopens after a series of ambitious renovations. A beloved local event celebrates a significant milestone, the county tries to unload services, and a tiny insect invades the Champlain Canal. All of these reflect some of the top stories from across Whitehall and the surrounding region in 2012. The following is a summary of the top five biggest events of the past year, as well as a few stories that didn’t quite make the cut but are worth mentioning. One of the biggest and most oft-repeated stories of the past year was also one of the biggest stories of 2010 and 2011: the Town of Whitehall’s search for a new town hall. But unlike previous years’ stories, this one actually has an ending. 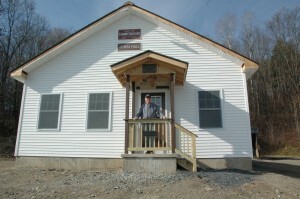 After squatting in the Canal Corp. Visitor’s Center for nearly six years, the town relocated to the former Skenesborough Volunteer Fire Company firehouse, known now as the Whitehall Municipal Center, earlier this fall. Officials spent more than $40,000 and a few months of labor renovating the building, which includes a shared office for the town clerk, budget officer, assessor, and supervisor, as well as a large meeting room and handicap accessible restroom. The renovations and the subsequent move were the culmination of a nearly six-year search that began after officials identified mold in their former offices, which were located in the building that housed City Steaks and Seafood on Main Street. Instead of spending money to abate the problem, officials moved into the Canal Corp. Visitor’s Center while they search for a viable alternative. When former supervisor Richard “Geezer” Gordon took office in 2010 he pledged to find the town a building it could call home and he left no stones unturned in the search. Officials considered the former Garden Time building, the Troy Shirt Factory, the Armory and the firehouse, several times. When Supervisor George Armstrong took office he forged ahead with those plans and on Oct. 15, the Whitehall Municipal Center opened for the first time. Currently, plans are being developed that will one day result in the Town and Village Courts moving into the building and perhaps one day the Whitehall Police Department and the village. Whitehall wasn’t the only local community that resolved issues related to its town hall. A few miles to the east, Hampton officials were busy laying the groundwork and the foundation for new town hall. After years of dealing with inadequate space and a structure that was literally sinking into the ground, the Hampton town board decided early in 2012 it was time to address the long standing issues with its offices. A public hearing was held last winter to determine what course of action voters would support: renovation of the old town hall or the construction of new building. After the public vetting it became clear that the vast majority of residents supported the construction of a new town hall and officials had a set of blue prints drawn up. For the next few months, officials poured over the logistics and in August ground was broken. Over the subsequent three months, contractors, residents and even town officials themselves, pitched in a modern-day version of a barn raising to construct the 1,460 square foot building on the east side of State Route 22A. The building, which Supervisor Dave O’Brien estimated would have cost $250,000 to $300,000 under normal circumstances, cost only $82,000 to erect and was paid for completely by sales tax receipts. A recurring problem for years, issues related to the village’s antiquated water system seemed to reach a breaking point in 2012. In March, the village Board of Trustees discovered it was owed approximately$142,000 in unpaid water bills. One user was estimated to owe the village $29,000 and four others had a bill in excess of $11,000, officials said. There were approximately 21 properties that owed the village money for their water service. All of the properties were located outside of the village where there was no mechanism in place to collect on the bills. In the village, if someone does not pay their bill, it’s reassessed onto the property taxes at the end of the year. Village officials said the unpaid water bills had accumulated over a period of a few years and blamed the problem on convoluted and outdated computer software that made it difficult to detect the problem. Officials moved quickly to remedy the problem and a few weeks after it was discovered they passed a resolution that gave them the authority to shut off service if the bills were not paid by the end of September. Since that time, a handful of users have paid their bills in full and a few have had their service turned off. Others have or are working on payment agreements with the village. Those who have done nothing face legal action. Shortly after it discovered the unpaid water bills, the New York state Comptroller’s Office released an audit that described the financial condition of the village’s water and sewer system as precarious. The audit discovered that water and sewer rates were not sufficient to cover operating expenses and that the village could not account for 55 to 73 percent of the water it processed at a cost of $79,000 to $129,000. Officials said much of the water loss was due to defects in the infrastructure of the water system, which is several decades old and in some areas corroding. During the last half of 2012, the village took steps to address some of the problems identified in the audit. A new water law was passed that mandates water meters are installed on every property in the village and bills from outside the village are reviewed by the board. The village has also completed or will complete a number of water line replacement projects. Mayor Peter Telisky said earlier this fall that the amount of water loss has decreased by approximately a third of what it was.